Whosoever considers homosexuality to be a moral issue has committed an abomination: they shall surely be mocked. Is this Mo in the veil. He should make sure that he is not in Belgium. Too true. Bigots are people too, you know. Was expecting a twist on the bomber episode in New York. Oh well Author knows best methinks…. Brilliant today. I’m sure that the Barmaid explaining that there’s no requirement to tolerate intolerance would be equally lost on this pair. And if those lyrics go by too fast for you, here they are so you can sing along. thanks DH that was new to me. Love Mo in the burqa – it emphasises his stare and makes it look truly unhinged. Poor, neglected bigots. It’s just sad the way they’re being forgotten. Gordon Brown, texture like sand. From what I’ve seen, homosexuality makes some bigots feel all funny inside. Joe Fogey, thanks for the introduction to Philippa Stroud. I can add her to my list of politicians to be ridiculed. I only wish her opinions would disqualify her for public office, on the grounds that she’s a barking nutter, but I’m afraid they just guarantee her a constituency. On the other hand… do you think she might cast out my demons with a laying on of hands? I could go for that. @madder: I think you’re onto something there. It makes some bigots sad because they don’t have the courage to come out of the closet themselves… which is sad in itself. But I feel sorrier for those they inflict their bigotry on. I think that would be a good test to run for office – Are there any groups of people you don’t want to represent equally to others? Yes, there are? That is the Judge Bork Hypothesis. People are harmed by knowing that ‘immoral’ activity is occurring. Will there be a strip about George Alan Rekers? I still like to think that ‘She’ in this instance is God, not the Barmaid. There is some sort of Catch-22 about tolerating intolerance — surely it is right … up to a point … but where the hell that point? Freedom of speech, but when speech incites actions, where does the true responsibility lie? My own gut is to kill ’em all & let Jeebus sort it out (‘Nam Vet! ), but my gut is frequently wrong (probably Tex-Mex food …). the point up to which we should tolerate intolerance is allowing people to have intolerant views and be able to express them. the tipping point is when the intolerance incites harm on others or is attempted to be shoehorned into law. But you don’t understand, the Truth that homosexuality is immoral is a Church Teaching, and it is a Sincerely Held Belief. That simply must be Respected. 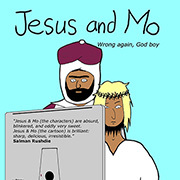 If Jesus and Mo are looking for a place where the feelings of bigots trump just about everything else, let them move to Mississippi where the white collared, rednecked cawing bigot is the state bird. I can tolerate everything but intolerance. Suppose a sincerely held belief is wrong, like that the world is flat, or is so probably wrong it might as well be, like that invisible pink elephants really do exist. (Hey, do you think people would still know what I meant if I wrote nvisible for ‘invisible’. like invisible with an ‘i’ that you can’t see?) Yeah, we can tolerate people who hold such beliefs, but we’re not going to show much respect for such wrongness. I thought wrongness was a sin. As long as they respect that I hold my homosexuality as beign moral and all around fun as a Sincerely Held Belief. we only have to respect the right to have a belief, not the content of said beleif. and if people don’t want their beleif content mocked or attract negative attention for it, perhaps they need to examine the content of their beleifs. I’ve been told many times that “Scotch” is either a beverage or a company that made tape, was that wrong or just a sincerely held belief to tolerate? Makes me wonder what a single malt Scottish would be like. Forgive me if this is well trodden territory. One doesn’t hear much on the subject out here in the colonies. Making bigots sad sounds like an admirable way to live a life. Jerry w — “Scotch” used to be perfectly acceptable usage (a book I read in my youth dating from the 1840s [the book, not my youth] about the Highlands used it exclusively) — sometime or other the Presbies got their knickers in a twist & insisted that the English used it as an insult (which is true of all English references to non-English in any case) — since my point is that the English won’t vote for a foreigner, the “insulting” form was intentionally used. “Women are trained to believe that this type of dress code is necessary for “modesty”. Apparently, the sight of any part of a woman’s body, including her face or hair, is considered sexually provocative in some cultures, and likely to inflame men’s lust. I was please to see Mo covered from head to foot in this cartoon! Thank you very friggin’ much, Simon. Now I’ll never be able to listen to the Stranglers again – not that GB was one of their better songs, but all the same.